Another fun painting I did at the convention.. there were so many fabulous balloon creations there, and Kara had been tapped to wear the Cinderella dress (which was just amazing!). 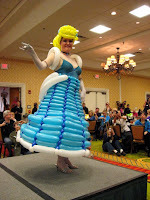 The balloons comprised just the skirt of the dress and she needed someone to paint her bodice.. I know a little something about Cinderella (check me out over at Fire Pixie Parties) and so was delighted to get to help out and get her painted. She had a great time being a princess (and we had a great time taking silly photos together). Kara's got a new web site up - check her out!